Optional Accessories: Tint Plate, Quarter Wave Retardation Plate, Quartz Wedge, Filters, Etc. 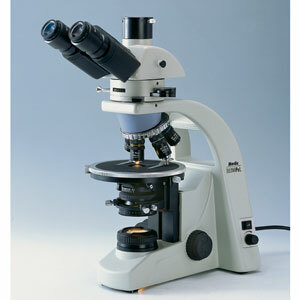 The Motic BA300POL polarizing microscope's superb optical performance and sophisticated features make it ideal for use in areas in which a polarizing microscope may be handy. It's the perfect choice for medical applications such as viewing microscopic crystals in urine, biochemistry and biomedical research, geology and geological engineering, the petroleum industry and many other settings. This trinocular configuration features a professional light distribution slider of 100% binocular or 100% photo, making it ideal for photo microscopy applications. The superior ergonomic design and robust mechanical structure make the BA300POL a great platform for future expansion. Optional tint plates, quarter wave retardation plates, and quartz wedges are available to complete advanced polarized light techniques..